Product categories of Camping Bed, we are specialized manufacturers from China, Camping Bed, Folding Camping Bed suppliers/factory, wholesale high-quality products of Military Camping Bed R & D and manufacturing, we have the perfect after-sales service and technical support. Look forward to your cooperation! Camping may become discouraging for most of us since they aren't capable of getting a good nights sleep. There's possibilities of you falling sick as you sleep on a floor that you aren't used to. Apart from falling sick, you'll also need to concern yourself with flying and non-flying insects which could bite you. 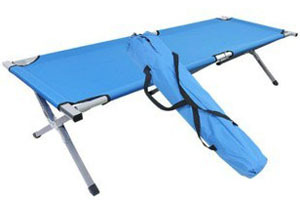 In case you genuinely want to enjoy your camping experience to the fullest, a camping cot/camping bed is your choose. Your camping experience will be drastically improved with a camping cot and You will be able to rest peacefully because you are raised above the floor and the chance of non-flying insects gnawing at you is minimal. Bites from a number of non-flying insects can be extremely deadly. You can avoid such things from happening by using a camping cot. Camping cots have two different types: End bar and No-End Bar construction. End Bar Construction Cots - The poles of the cots form an 'X' shape at each end. They're very firm and provide full support for your entire body. The problem with end bar design cots is that they have sharp edges. There's risks of these edges cutting a hole on the tent surface. No-End Bar Design Cots - the cots have four rectangular bars spaced across the cot. 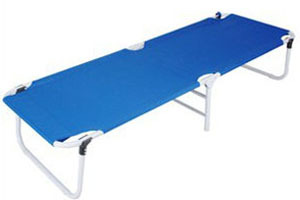 These cots will also provide complete support to your body much like the end bar construction cots. Both End Bar and Non-End Bar construction cots are made of polyester material. Polyester material works extremely well simply because of its durability and water resistant quality. The frames are generally made of steel or an alloy of aluminum. Aluminum can be used because of its strength, flexibility and weight.